There has been a castle on the site at Chilham since 709, when Wihtred, King of Kent, built a fort, probably of wood. ‘Cilleham’ was mentioned in the Domesday Book – ‘Sired held it from King Edward’. Today, visitors to the house that is now known as Chilham Castle will see The Keep nestling alongside. This great grey block is all that remains of a medieval fortress that once covered eight acres, including three baileys and a barbican gate. Garrisoned throughout the Middle Ages, it has never witnessed military conflict, although it was surrendered to the Crown many a time and once commandeered by a prince of France. With a few interruptions, it was held for nearly 260 years by the family of Fulbert de Lucy then, over a couple of centuries, by the line of Bartholomew de Badlesmere. Today, it is a privately-owned residence. King William the Conqueror granted the holding to his half-brother, Odo, Bishop of Bayeux. The under-tenant was Fulbert de Lucy, who retained possession after Odo fell foul of the King. Fulbert, as part of his feudal duty, built a keep at Chilham (probably of wood) and provided some of the garrison at Dover Castle, where he built the Chilham Tower. 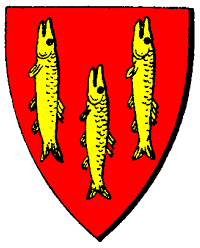 Fulbert’s family adopted the name de Dover (being more important than Chilham). In the 1170s, Fulbert, son of John de Dover, built the stone keep and fortifications, employing Ralph, master-mason to Henry II. Three decades later, Fulbert died, but as his heiress Roese was too young to marry, the castle reverted to the Crown under King John, who granted it in quick succession to Fulk (Foulke) de Bréant and then (after his acquittal for treason) to Thomas Peverell. Meanwhile, Fulbert’s orphaned heiress Roese (1207–65), great-great-granddaughter of the first Fulbert, a ward of the Crown, was married to King John’s son, Richard fitzJohn (c1186–c1248), who thereupon was granted the Barony of Chilham and his wife’s family name of Dover. In 1216, the castle was occupied briefly by the Dauphin, heir to the French throne. Having captured Canterbury, he was on his way to London to claim the English throne, which had been offered to him by rebellious barons. He was forestalled by the death of King John. The barons changed their minds and, favouring John’s infant son Henry, sent the foreign prince back home. The authorities differ over what happened next. Some say that after Richard fitzJohn died, Roese was married again to another Richard, who adopted successively the names de Dover and then de Chilham. Others say that Richard de Dover and Richard de Chilham were two people – Roese’s son and grandson. All agree that the next in line was Isabel de Chilham. Brought up in the King’s Court, she was married to David de Strathbolgi, Earl of Atholl (c1240–70), a Scottish aristocrat and a leading ally of England in the Scottish Wars. In 1270, Isabel, now châtelaine of Chilham, having lost father and husband in that same year, was married to an even more powerful Scot, Alexander de Baliol, Lord of Cavers, Grand Constable of Scotland under Edward I of England and cousin to John Baliol, Scotland’s puppet king. In 1280, a document known as the Kirkby Inquest gives the earliest written mention of the famous heronry at Chilham Castle. After Alexander’s death, the castle reverted to Isabel’s child, John de Strathbolgi, 9th Earl of Atholl. A contemporary of William Wallace and Robert the Bruce, Earl John played a major part in the Scottish Wars of Independence but, unlike his father, he fought against England. Since he held lands in England and had sworn allegiance to King Edward I of England as Lord Paramount of Scotland, Earl John was regarded in England as a traitor. Captured at the castle of Kildrummy in Scotland, he was brought back to his Kentish territories for execution. To the pleadings of the Queen and English nobles for mercy for this high-born prisoner, the response of King Edward was to promise that, ‘his only privilege shall be to hang on a higher gallows than the rest, as his treasons have been more flagrant and numerous’. So at Canterbury, in 1307, where his mother Isabel lay buried in the cathedral, Earl John was hanged, drawn and quartered. His severed head was taken for display upon a pole at London Bridge, beside that of William Wallace. Chilham reverted once again to the Crown, but within months, King Edward I followed Earl John to the grave. In 1312, his successor King Edward II granted Chilham with several additional holdings to a famous man of Kent and a sworn enemy of the Scots, Bartholomew ‘the rich Lord de Badlesmere’. 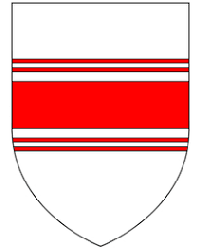 When Badlesmere’s lands were forfeited, as described below, possession of Chilham was restored briefly to the line of de Lucy in 1322, when King Edward II passed Chilham back to David de Strathbolgi, 10th Earl of Atholl, the son of the 9th Earl, son of John, the unhappy 9th Earl, mentioned above. David too fell victim to Scotland’s uncertain loyalties. Because his father-in-law, Red John de Comyn, had been murdered by Robert the Bruce, Earl David allied himself with the English. Doubtless the lordship of Chilham was his reward. Four years later, in 1326, he was killed on the field of battle. 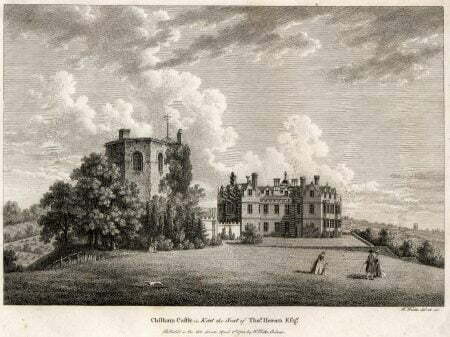 Chilham’s longest connection with one family, which had lasted over two centuries, stretching back to the Conquest, had finally come to an end. Bartholomew, Lord Badlesmere was born at Chilham in 1280. He was at times Governor of the castles at Bristol, Tonbridge, Leeds and Dover, and Lord Warden of the Cinque Ports. Eventually, however, Kent’s ‘over-mighty subject’ became, like his Scottish predecessor at Chilham, an enemy of the Crown. After being refused entry to Leeds Castle by Margaret, Lady Badlesmere, Queen Isabella, wife of King Edward II, wanted Badlesmere’s downfall. She demanded redress and, following the surrender of the castle at Leeds, Henry de Valoynes, who held Chilham on behalf of Badlesmere, surrendered the castle on 1 November 1321 to two knights from the King’s army. This was the first military event in Chilham’s history. After a brief rebellion, allied with other rebellious barons and his former enemies the Scots, Badlesmere was captured in 1322. Taken back to the gibbet in his own manor of Blean, near Canterbury, Badlesmere suffered the same gruesome death as his predecessor, John de Strathbolgi, 9th Earl of Atholl, 14 years before. Of lower rank than Earl John, his head was displayed locally, on the Burgate at Canterbury. Then, completing her revenge, the vindictive Queen had Margaret, Lady Badlesmere, and her children imprisoned in the Tower of London. Having imprisoned and murdered her husband, Isabella ruled the realm in the name of her son, Edward III. Some years later, after wresting power from his mother, the new King overturned much of what his parents had done. 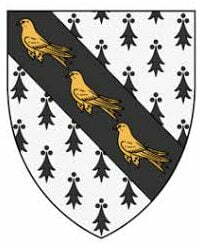 Making amends, he bestowed Chilham upon Giles de Badlesmere, 2nd Baron, whose family then held it, with just one interruption, for the following 200 years. On the death of Giles in 1364, possession passed to his sister Margery, wife of William Lord Roos of Hamlake (Helmsley in Yorkshire). In 1381 during the Peasants’ Revolt, Chilham’s second military incident occurred, the so-called Battle of Chilham. Some local peasants made a futile attack upon the castle before joining the march to London led by Wat Tyler of Dartford. After Tyler’s death, the revolt collapsed and peace returned. The Roos family kept possession until, during the Wars of the Roses, Thomas Lord Roos forsook his Yorkshire roots and espoused the cause of Lancaster. After the Battle of Towton, near Tadcaster, he was executed by order of the Yorkist King Edward IV, who passed Chilham to the Controller of his Royal Household, Sir John Scott of Scotts Hall, Smeeth, near Ashford. Sir Alexander Baliol, Lord Cavers, Lord of Chilham 200 years earlier, was Sir John’s six-times great-uncle. As their grand monuments in Brabourne church make clear, the Scotts of Scotts Hall were once a family of considerable status and renown. Now they’re remembered only by scholars. In 1485 Sir John Scott died. King Henry VII, founder of the Tudor dynasty, restored Chilham in 1502 to Thomas Manners, Lord Roos, great-grandson of that other Thomas who, at the cost of his life and possessions, had joined the Lancastrians. In 1539, King Henry VIII, with coffers replete from despoiled church property, offered cash to buy the estate. Thomas (now Earl of Rutland, well advanced in years and with large holdings in the Midlands) took the money. This was the first of many sales over the centuries, but the only one to a monarch. Once again (for the 10th time since the Conquest), the castle became Crown property, severing the Badlesmere connection for good. Three years later, in 1542, Sir Thomas Cheney, Constable of Dover Castle, Lord Warden of the Cinque Ports and Treasurer to the King’s Household, acquired the castle by a formal grant from the King. A decade earlier, Cheney had made Shurland, his great house tucked away on the Isle of Sheppey, available for the King to pass a few stolen days with his paramour Anne Boleyn. Shurland was Cheney’s pride. For him, the old castle at Chilham was no more than a source of building material. He slowly dismantled its fortifications and ferried the stones away via Stour and Swale to the seven courtyards of his island refuge. Thomas’s extravagant son Henry, Baron Cheney, sold the ruin to his neighbour Sir Thomas Kempe of Olantigh. Kempe’s son, another Thomas, died without male heirs and left the almost empty site to his four daughters. One of them, Mary, married Sir Dudley Digges of the City of London and Barham near Canterbury. Having bought out his brothers-in-law, Digges built the present house, to which the ruined keep has served in turn as outhouse, brewery and water-tower. In the 20th century, the Keep became, once again, a separate dwelling, and in the 1990s it was sold.